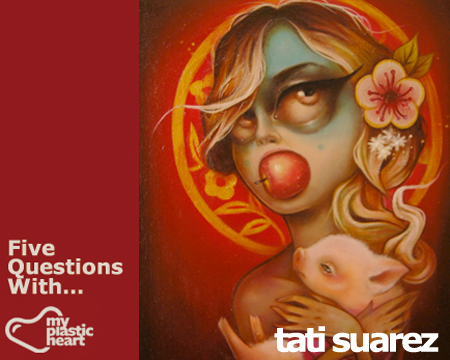 Five Questions With… Tati Suarez! We spoke to New Moon 2012 artist and creator of a plethora of doe-eyed beauties, Tati Suarez for our “Five Questions With…” post. When you are feeling unmotivated to create art, what do you do to inspire yourself? I make myself step back and take a little break. Going for walks to uncomplicate my head usually works. While on these walks, I find a lot of cool shops or a bookstore where I find goodies that will inspire me. Attending art shows. Watching movies. Traveling (need more of this please). What artists’ work are you a fan of at the moment? Ah, there’s so many! At the moment – Alphonse Mucha, James Jean, Joao Ruas, Chet Zar, Glenn Bar, Chris Sanders, Tara McPherson,and Miss Van to list a few. We have seen a lot of mural work from you. Do you prefer this to working smaller, like on canvas or board? They’re both really fun! However, I still prefer painting in my studio on a board or canvas. I’m still not comfortable with people watching me work, especially witnessing the beginning stages. I also never feel quite satisfied with the mural pieces because I tend to treat them like oil paintings – so much blending and perfecting for something that’s meant to be viewed from afar. I keep wanting to spend more time with them. I love painting them tho, it’s rewarding to see one of my ladies in such a large scale and in the outdoors! Why are you drawn to creating female characters in your work? All my drawings growing up were cartoons, girls, & animals, especially Disney princesses. I’ve just always been fascinated with female figures and the shapes that their bodies make – they’re just beautiful. Beautiful vessels to capture and share emotions and tell stories. Do you think your Brazilian and El Salvadorian heritage affect the style and content of your work? If, yes, how?